On the first day of the 15th annual European Space Weather Week, this image from the NASA/ESA Hubble Space Telescope fittingly shows a striking occurrence of celestial weather in the outer reaches of the Solar System: an aurora on Uranus. Auroras, also known as polar lights, are a relatively familiar type of space weather to Earth-based stargazers, but have also been spied on many other planets in the Solar System. Views of the Earth's Northern and Southern Lights show glowing sheets and rippling waves of bright light painting the sky in striking shades of green and even red, blue, and purple; these breath-taking scenes are created as streams of energetic charged particles hit the upper layers of Earth's atmosphere at altitudes of up to a few hundreds of kilometres, and interact with resident atoms and molecules of mostly oxygen and nitrogen. These emit photons at specific visible wavelengths or colours - green and red for oxygen, blue and purple for nitrogen - and fill the sky with an eerie auroral glow. Hubble has observed auroras on Uranus on various occasions: in 2011, when the telescope became the first to image the phenomenon from the vicinity of Earth, then again in 2012 and 2014, taking extra data beyond visible light. 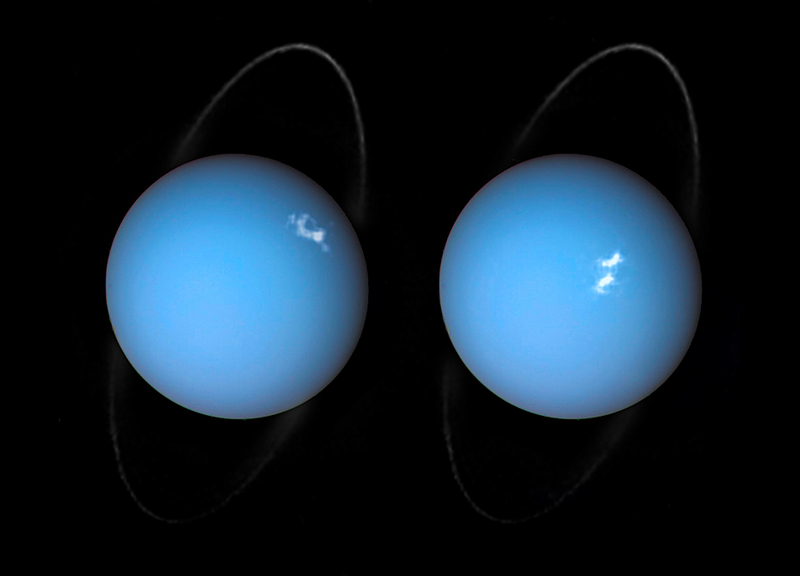 By pointing Hubble's ultraviolet eye on Uranus twice during the same month, from 1 to 5 and 22 to 24 November 2014, scientists were able to determine that the planet's glimmering auroras rotate along with the planet. The observations also helped to locate Uranus' magnetic poles, and allowed scientists to track two so-called interplanetary shocks that propagated through the Solar System. These shocks were triggered by two powerful bursts of material flung out by the Sun via the solar wind, an ongoing flow of charged particles constantly emanating from our star, and caused the most intense auroras ever seen on Uranus. This image, originally published in 2017, shows the auroras as wispy patches of white against the planet's azure blue disc, and combines optical and ultraviolet observations from Hubble with archive data from NASA's Voyager 2 probe. Voyager 2 was the first and only craft to visit the outermost planets in the Solar System; it flew past Uranus in January 1986, and past Neptune in August 1989. These icy planets have not been visited since. NASA and ESA have been studying a possible joint mission that would target the two ice giant planets in order to explore their intriguing role in our planetary system. European Space Weather Week runs from 5 to 9 November 2018, and brings together engineers, scientists, specialists, and professionals from across the continent in order to exchange news, ideas, and strategies on space weather and protecting Earth's cosmic environment.